In 1955 the Kansas City Athletics coaching staff “observed [rookie right-hander Art] Ditmar during spring training and prophesied that he was destined for distinction on the mound.”1 This bright assessment was echoed three years later by New York Yankees manager Casey Stengel, who said, “I believe ... Ditmar could grow into one of the big pitchers in the majors. ... [T]he first thing he must develop is the realization that he is as good as he is, and that he has so much in him.”2 This latter appraisal seemingly explains the Old Perfessor’s decision to start Ditmar in Game One of the 1960 World Series. Though his choice has been roundly condemned by armchair managers through the years, the decision did little to remove the label of invincibility that once surrounded the hard-throwing hurler. Arthur John Ditmar was born on April 3, 1929, the second of three children of George Edward and Caroline Dorothy (Huysman) Ditmar, in the Boston suburb of Winthrop, Massachusetts. He was the great-grandson of German immigrant Henry V. Ditmar, who arrived in the Bay State in the first half of the nineteenth century. In 1855 Henry married Isabella Logan, an Irish immigrant, and they raised six children to adulthood. Their youngest son, Francis “Frank” Ditmar, pursued a career as a house painter in Boston and in 1891 married Massachusetts native Mary Canavan. This union produced five children, the youngest of whom was Art’s father, George. In the 1920s George launched a career in sales and married Caroline. After the birth of their children the family moved to the other end of the state, settling in Pittsfield, Massachusetts. In 1948 Ditmar was assigned to the Moline/Kewanee (Illinois) A’s in the Central Association (Class C). Among the most durable pitchers in the league, the 19-year-old placed among the league leaders in appearances (33) and innings pitched (193). This was accompanied by a large yield in walks (108) that contributed to a pedestrian record of 9-9, 3.68. The next year Ditmar was promoted to the Savannah Indians in the South Atlantic League (Class A). Initially projected as a starter, he was moved to the bullpen after right-hander Harry Byrd, who was expected to compete in the majors, failed in spring training and was assigned to the Indians. Ditmar made occasional starts and on June 16, 1949, he delivered a four-hit shutout against the Charleston Rebels. More importantly, he lowered his walk ratio by nearly 30 percent to finish with a record of 7-6, 2.85 in 142 innings. The Rebels fell victim again the following season when Ditmar tossed another shutout on April 24, 1950, while surrendering just one hit. The win was the first of his minor-league career-high 13 as he anchored the Indians staff alongside fellow right-handers Duke Simpson and Kelly Swift. But Ditmar was unable to build upon this success by 1953, when he was drafted into the US Army during the Korean War. He did not see combat and spent a portion of his service at Camp Atterbury, Indiana, where his teammates included future major-league hurlers Frank Lary and Tom Brewer. On April 26, 1953, Ditmar made his return among the professional ranks with the Ottawa A’s in the Triple-A International League. It did not go swimmingly. With the exception of a four-hit shutout against the Toronto Maple Leafs in May, he struggled with his control through most of the season en route to a record of 2-13, 5.30. Optioned to Savannah in July, Ditmar rebounded with a perfect 7-0 posting that included a three-hit shutout of the Augusta Rams.5 The abrupt turnaround captured the imagination of the pitching-poor Philadelphia Athletics and Ditmar was selected among the September call-ups though he did not make an appearance. During the offseason Ditmar was added to the club’s 40-man roster. The following spring Ditmar competed with three others for the club’s fifth-starter role. Though he fell short in this competition, his strong Grapefruit League campaign earned the 25-year-old a spot on the parent roster. On April 19, 1954, Ditmar made his major-league debut in Washington’s Griffith Stadium in relief of lefty starter Morrie Martin. Entering in the sixth inning against the Senators tasked with protecting a 3-1 lead, Ditmar walked the first batter he faced, slugger Roy Sievers, before retiring the side. Far less success ensued in the seventh when a throwing error by A’s first baseman Don Bollweg led to two unearned runs. The game remained tied into the ninth when Ditmar surrender a walk-off homer to leadoff hitter Eddie Yost. After a dismal appearance on May 3 against the Chicago White Sox – a game in which few Philadelphia pitchers shone in a 14-3 blowout – Ditmar pitched eight strong innings of relief over three appearances to earn his first major-league start. Facing the Senators on May 21, he was lifted after the first inning after surrendering five hits and two walks to the first eight batters. A similar fate awaited Ditmar in Boston 10 days later when a three-run homer by Ted Williams in the first and a bases-loaded walk in the second made for a very short outing. On June 12 Ditmar was optioned to Ottawa. Though he struggled with a sore arm in Ottawa, his 6-12 record was deceptive as he received little run support from the offensively inept last-place club. Recalled by the Athletics in September, Ditmar drew a September 19 start at home against the Yankees. Following a leadoff single by second baseman Gil McDougald he held the Bombers hitless through 4⅔ innings before wriggling out of a bases-loaded jam in the fifth. He did not figure in the decision. Ditmar got a second start a week later in Yankee Stadium. In the meaningless season finale, Stengel fielded a unique lineup with center fielder Mickey Mantle at short and catcher Yogi Berra at third. The future Hall of Famers handled their posts flawlessly as the Yankees captured a slim 3-2 lead through four innings before the A’s offense – a generally ineffective lot throughout the season – opened for three runs in the fifth. 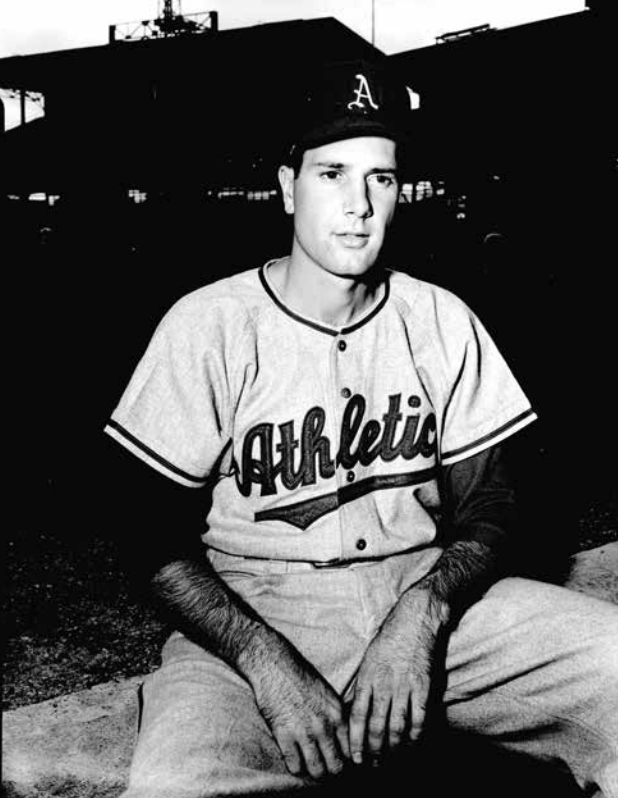 Though lifted after 5⅔ innings, Ditmar earned his first major-league win while also collecting the last victory for the Athletics as a Philadelphia-based club. Except for a strong performance against the Detroit Tigers on March 27 – a two-hit gem he shared with veteran righty Lou Kretlow – Ditmar struggled through much of Athletics’ 1956 spring training. Despite the setbacks he was tabbed in a poll of nationwide scribes as the most likely Kansas City hurler to win 20 games in 1956; as it turned out, they had the number in the wrong column. Initially Ditmar appeared poised to prove the scribes correct when he tossed a one-hitter against the White Sox on April 21 in a 15-1 blowout. (A decent hitter, Ditmar collected two hits, one of which came when the Athletics scored a then-major league record 13 runs in the second inning, all the runs scoring with two outs). Less than three weeks later he collected his second career shutout by scattering seven hits against the Orioles in Baltimore. Yankees assistant GM Bill DeWitt ranked Ditmar among the AL’s best flamethrowers and the interest from New York only intensified after the righty tossed another shutout on May 27 against the Tigers. But the Splendid Splinter’s 20-win prediction was not in store for Ditmar. In his first three starts in the 1957 season, Ditmar surrendered 27 hits and 9 runs over 15⅓ innings that prompted Joe King to write in The Sporting News, “[He’s] as easy to hit as a Class D rookie with a straight ball.”12 Far more success was found working from the bullpen, where Ditmar posted a 6-1, 1.75 ERA record in 35 relief appearances. He continued to earn occasional starts throughout the season, including a 4-3 win against the White Sox on June 13 in which a wild pitch sent Chicago’s Larry Doby sprawling and precipitated a 28-minute bench-clearing rhubarb. Ditmar was fined $100 for the errant throw. Beginning at the season’s one-quarter mark, the Yankees initiated a 75-38 run to easily capture their 23rd AL flag, providing Ditmar with his first postseason experience. On October 3 he entered the fourth inning of Game Two of the World Series against the Milwaukee Braves trailing 4-2 with no outs and a runner on third and induced two infield popups and a grounder to short to stem the bleeding. Before being lifted in the seventh for a pinch-hitter, he surrendered just a bunt single over four innings to keep the Yankees close in an eventual 4-2 loss. A week later Ditmar added to his scoreless string with two innings of one-hit pitching in Game Seven. When the Series ended in seven-game defeat, he was the only Yankees pitcher to go unscored upon (more than one inning) in the fall classic. In 1958 Ditmar extended his World Series scoreless string another 3⅔ innings after narrowly dodging a return to Kansas City. Having started the season in the bullpen, Ditmar was initially packaged alongside veteran outfielder Harry Simpson in a June 15 trade for A’s pitchers Duke Maas and Virgil Trucks until, at the last minute, the parties agreed upon righty Bob Grim instead. (This was after Ditmar chipped in with teammates Mickey Mantle, Don Larsen, Tom Sturdivant, and Jerry Lumpe to purchase an eight-year-old sedan to carpool from their New Jersey homes to Yankee Stadium.) Ditmar was moved into the Yankees rotation to spell injury-plagued righty Tom Sturdivant. On July 23 he carried a three-hit shutout into the ninth against the Tigers before a string of singles forced him to settle for a 16-4 win. Two complete game wins in August lifted Ditmar’s record to 8-2, 2.50 before he was moved back to the bullpen following a 1-5 slide. On September 14 Ditmar secured the final out in the pennant-clinching 5-3 win over the Athletics. He finished with a record of 9-8, 3.42 in 139⅔ innings. On October 8 Ditmar appeared in Game Six of the 1958 World Series in relief of a struggling Whitey Ford. Entering the second against Milwaukee trailing 2-1 with one out and the bases loaded, Ditmar induced perennial All-Star shortstop Johnny Logan to fly out to left on the first pitch. When Andy Pafko attempted to tag up, left fielder Elston Howard threw a strike to catcher Yogi Berra to end the inning. Ditmar held the Braves to two hits over the next three innings before being lifted for a pinch-hitter in an eventual 4-3 Yankees win. The next day he earned his only championship ring when New York outlasted Milwaukee in Game Seven. During the offseason the Yankees turned away numerous offers for Ditmar. This decision proved prescient when the righty, in the wake of reigning Cy Young Award winner Bob Turley’s 1959 struggles, became one of the staples in the Yankees rotation. “[The sportswriters] don’t say much about this Ditmar,” Stengel said. “[B]ut he is one pitcher who never says my arm is no good. ... he is a manager’s kind of ball player.”13 With the exception of a fifth-inning homer by Rocky Colavito on May 1, Ditmar threw seven innings of perfect baseball in an eventual 4-2 loss to the Indians.14 Six weeks later he surrendered a first-inning run before shutting down the White Sox on two hits in a 5-1 complete-game win. But his finest performance of the season came on August 28 when Ditmar delivered a two-hit shutout against the Senators while helping his own cause by driving in three runs and connecting on his second (and last) career homer, a solo blast off righty Camilo Pascual. By season’s end Ditmar had posted a major-league-best 1.030 WHIP over a career-high 202 innings. A respectable 13-9 record might easily have been better but too often Ditmar received little or no support from his Yankees teammates – he compiled a 1.94 ERA in nine of his 25 starts but had four losses and five no-decisions to show for it. Despite this difficult outing, Ditmar was the starter for Game Five at Yankee Stadium, where he had a superb 10-2, 2.29 record during the season.17 Unfortunately for the Yankees, the results were approximately the same when Ditmar yielded three runs (one earned) on three hits in 1⅓ innings. Meanwhile, two shutouts delivered by Whitey Ford in the club’s losing cause contributed to accusations that Stengel had mismanaged the staff, accusations that led to the skipper’s dismissal five days after the Series ended. Exemplified by the addition of 18-year-old high school grad Lew Krausse to the rotation in June, Kansas City was in the throes of a youth movement; in 1961 the A’s had little incentive to use Ditmar as anything more than a spot starter. Over 16 appearances (four starts) beginning July 4 he struggled through a 6.56 ERA and finished the season with a record of 2-8 in 108⅓ innings (his fewest innings pitched since his 1954 debut in Philadelphia). Throughout the season sportswriters trying to understand Ditmar’s precipitous drop in 1961 frequently chalked it up to a sore arm – something the veteran righty vigorously denied. He would not be as fortunate in 1962. In spring training Ditmar hurt his arm but was able to persevere sufficiently to grab a spot in the Athletics rotation. He made four starts through May 12 but struggled with his control. On May 19 Ditmar took the mound in Washington’s D.C. Stadium and surrendered three runs and six hits in 2⅔innings. It proved to be his last major-league appearance. Six days later he was released. In June, Stengel, who was managing the expansion New York Mets, arranged a tryout for Ditmar but nothing came of this. He secured a stint with the Yankees’ Richmond affiliate in the International League but was released on July 5 after just two weeks. Determined to make his way back to the majors, Ditmar got permission to work out with the Yankees through the fall and joined the club as a nonroster invitee the following spring. But when he did not make the club in 1963, he retired. On October 1, 1956, Ditmar married Missouri native Mary Jane Creel, a Trans World Airlines hostess four years his junior. The union produced four children (three boys and one girl) before dissolving in divorce in 1970. During these years Ditmar attended American International College in Springfield, Massachusetts, in the offseason and earned a bachelor’s degree in 1962. He remained at AIC in pursuit of his master’s degree while coaching the college’s basketball and baseball teams. (Major-league catcher Fran Healy was one of his players.) Around 1971 Ditmar married Dianne Meara, a professor at AIC, and moved to Cleveland suburb of Brook Park, Ohio, where he became the city’s director of parks and recreation. In 1986 he retired to a life of golf, tennis, and leisure in Myrtle Beach, South Carolina. During the 1980s the Anheuser-Busch Brewing Company spun a Budweiser television commercial that incorporated the famous Bill Mazeroski homer in the 1960 World Series. The original NBC radio broadcast had incorrectly identified Ditmar as the pitcher who surrendered the Series-ending blow. (One report suggests he was warming up in the bullpen when the drive was struck.) When the audio was replayed more than 20 years after the fact, Ditmar sued the brewing company for $500,000, claiming “the commercial held him up to ‘undeserved ridicule, humiliation and contempt.’”19 A U.S. district judge threw out the case. Throughout his playing career Ditmar was a frequent speaker at Chamber of Commerce and sports jamboree functions and, in 1960 at the annual Sportswriters Alliance Gold Key dinner in Hartford, Connecticut. In at least two years he also spent the offseason barnstorming in New England and Canada. In retirement he was a frequent participant at autograph shows and Old Timer’s Games and in 2015 he was inducted alongside West Springfield native Vic Raschi into the Western Massachusetts Baseball Hall of Fame. Ditmar concluded a nine-year major-league career with a record of 72-77, 3.98 in 1,268 innings, a far cry from the expectations of the Athletics coaches in 1954. But with the exception of two fine seasons in the Bronx, his pedestrian record can be attributed in part to the second-division clubs for whom he played. The author wishes to thank SABR members Bill Mortell and Rod Nelson, chair of the SABR Scouts Committee, for their valuable research. In addition to the sources cited in the Notes, the author also consulted Ancestry.com and Baseball-Reference.com, and a 1992 SABR Oral History interview with Art Ditmar conducted by Irv Bergman, July 10, 1992. 1 “Kaycee Can See Improvement in A’s – Particularly in Pitching,” The Sporting News, June 1, 1955: 6. 2 “Not-for-Sale Sign Pinned on Ditmar, Casey’s Prize Pupil,” The Sporting News, December 24, 1958: 4. 3 The Philadelphia Athletics showed interest in signing George before he suffered an arm injury in college. 4 A second source indicates that scout Dutch Brennan signed Ditmar. 5 Another source suggests eight wins. 7 Ditmar also placed among the league leaders in yield of homers (23), earned runs (98), wild pitches (7), and HBP (7). 8 “Lou Labels Ditmar as Dandiest Kaycee Mound Discovery,” The Sporting News, October 5, 1955: 17. 10 "Ditmar Seen as Key Player in Yank-A's Deal," The Sporting News, February 27, 1957: 5. 11 “Yankee Trades Also Help A’s,” The Sporting News, June 26, 1957: 12. 12 “Yanks Collect Early Dividends on Their Ditmar, Shantz Deal,” The Sporting News, May 15, 1957: 11. 13 “Perfessor Praises Ditmar; Manager’s Kind of Player,” The Sporting News, February 18, 1959: 7. 14 Of the 17 home runs Ditmar yielded in 1959, four were struck by Colavito, all on first pitches. 15 “Casey Tosses Bouquet to Lion-Hearted Hurlers,” The Sporting News, September 7, 1960: 7. 16 Rich Marazzi and Len Fiorito, Baseball Players of the 1950s: A Biographical Dictionary of All 1,560 Major Leaguers (Jefferson, North Carolina: McFarland, 2003), 93. 17 Dan McHale, “Bill Stafford,” SABR Biography, accessed August 8, 2016. (sabr.org/bioproj/person/0a22d550). 18 “Front-Liners Drill at Yank Kiddie Camp,” The Sporting News, February 22, 1961: 10. 19 “Ditmar Suit Rejected,” The Sporting News, October 24, 1988: 42.